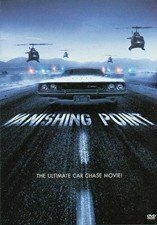 An offbeat mix of road action and existential drama that has earned a cult audience, this chase movie stars Barry Newman as a Vietnam vet and ex-cop who bets a friend he can drive a car from Denver to San Francisco in 15 hours. Soon Newman is pursued across the country by an armada of police and cheered on by a blind D.J. and his listeners. With Cleavon Little, Dean Jagger. Includes both the U.S. and U.K. versions; 98 min./105 min. Widescreen (Enhanced); Soundtracks: English Dolby Digital stereo, Dolby Digital mono, Spanish Dolby Digital mono, French Dolby Digital mono; Subtitles: English, Spanish; audio commentary; theatrical trailer; TV spots.